Hello! 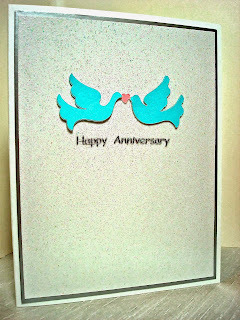 Today I have an Anniversary Card to show you that I made with my Cricut Machine. It was suppose to be a quick and easy card that I was going to keep very simple due to lack of time, yet nothing is ever quick and easy with a Cricut Machine. Ugh! I have such a love/hate relationship with that machine. Does anyone else own a Cricut and get frustrated with it like I do? I think it's a great machine for mass producing, it proved to be very handy for my daughter's wedding three years ago, and I think it's great for teachers who need to cut letters and large images for classrooms, but I find it terribly frustrating to use for card making. First of all, I have to look through hundreds of cartridges just to find a image to use, then I have to figure out the size, the tension, the speed, the blade depth. I think I spent a couple of hours on this silly little card, wasted a lot of paper, and made several mishaps, before I finally got the image cut correctly. I don't know if I have a defective Cricut, or if I'm defective, but I always struggle with getting a good, clean cut, especially with smaller, more intricate images. The machine either cuts too deep and rips up the paper, or it cuts too little, and I can't remove the image from the card stock. I've tried changing the blade, adjusting the blade depth, the speed....nothing helps. So usually my machine and all the hundreds of dollars I've spent on cartridges, just sit and gather dust, and I end up using my old fashioned Cuttlebug and standard steel dies instead...which ALWAYS work. So often when paper crafting I make mistakes which end up being blessings. I had to keep re-cutting this image to get it right that I ended up with several layers. I then took the worst of the layers which had flaws in them, and glue them all to the bottom of the best layer; it ended up creating a really neat dimensional effect. To make a Clean and Simple card dramatic, I used a metallic paper base underneath a layer of Glitter paper and then added a metallic silver sentiment sticker. So after a long, frustrating experience, it all turned out o.k. in the end. An elegant and sweet card Amy ! 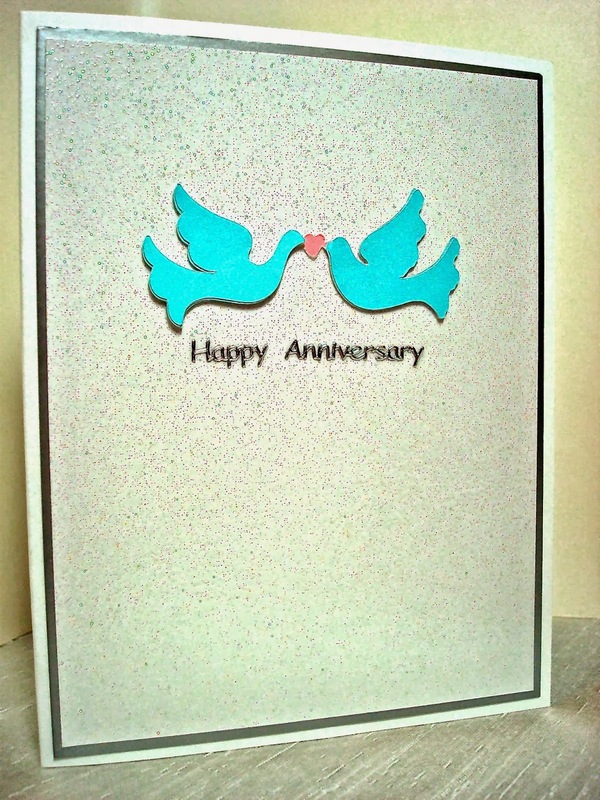 Love it, a wonderful CAS card and the doves are a delight!